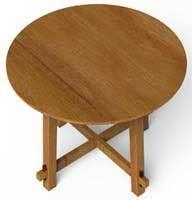 This round side table has the beauty of genuine mission style furniture. 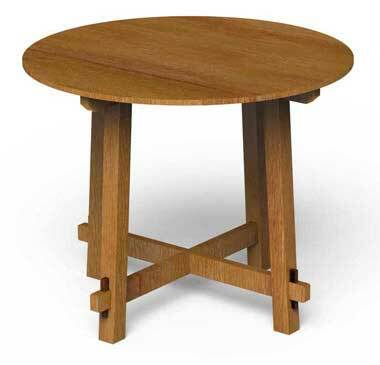 Click here for detailed round side table plans. It may be built of plain-sawed red oak, or of quarter-sawed white oak. 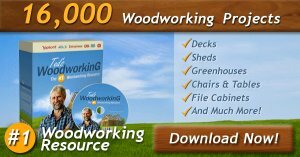 The wood should be thoroughly seasoned and devoid of imperfections. 1 top piece, 3/4 in. thick by 36 in. square, S-2-S.
4 legs, 2-1/2 in. square by 30 in. long, S-4-S.
2 upper horizontals, 1-1/8 by 2 by 36 in., S-4-S.
2 lower horizontals, 3/4 by 2-1/2 by 35 in., S-4-S.
4 keys, 1/2 by 1 by 5 in., S-2-S.
Lay out and cut the circular top first. Next cut the four legs to length. To get the slopes for the ends of the legs and the shoulders of the tenons, lay out a full-sized drawing in pencil and lay the bevel along these lines, adjusting the parts to the lines. The top horizontals have grooves cut on either side to allow the posts to "set in." This is to give the frame more rigidity. The lower horizontals or stretchers are to be tenoned through the posts and keyed. That the keys may be alike in size, a good plan is to make them first, then make the mortises in the stretchers to correspond. Work the keys to the proper thickness, unless they were ordered so, then to length and joint one edge straight and square. Next lay off across the key the lines A and B of the drawing so that A shall measure 1/2 in. and B 3/8 in. Draw a sloping line through these points and work this edge of the key to size and shape. Round the top of the key as shown. Then mortise, in the tenon, for the key can then be laid out to 1/2 in. for the top opening and 3/8 in. for the bottom. The table can be finished in any one of the many mission stains available. Allow the stain 12 hours in which to dry, also each coat of filler. With a soft cloth apply as thin a coating of wax as can be and still cover the wood. Wax is in paste form. Allow this to stand five or ten minutes, then rub briskly with a soft dry cloth to polish. Let stand 24 hours, then apply another coat.